Close to Oradour Fanais, in a small counrtyside hamlet, 4/5 bedroom old farmhouse, swimming pool, barn, private garden and paddock area. 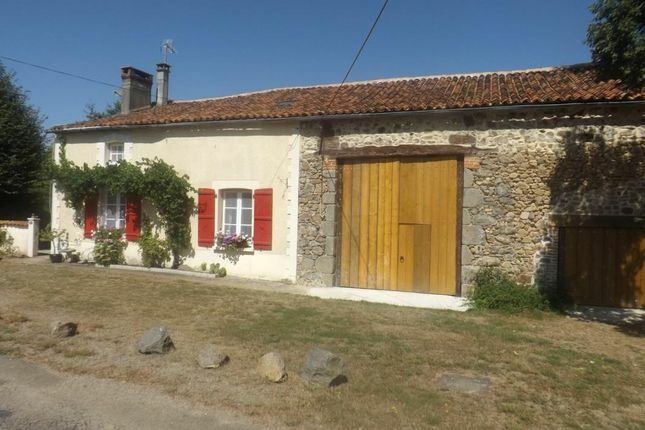 This property could be used as a gite, bed and breakfast busniess and animals. The ground floor comprises of a large kitchen/lounge with fitted kitchen with induction hob and double electric oven. The lounge has a 16th century fire brick fireplace with wood burner and chestnut flooring in kitchen and lounge. There is a summer room with spiral case to upstairs and double doors out to a private terrace with herb garden and awning. There is a study which can be used as another bedroom, another large bedroom and a large luxury shower room. On the second floor are three large bedrooms, one with ensuite shower room and family bathroom and large airy hallway. There is a utility room and various outbuildings and barn with electric with workshop. In front of the property is a gravelled area with parking of cars. The garden is separated into parts with has a large paddock area with large animal shelter and duck pond, beautiful mature garden and grassed area with underground pool with cover and heating. The house has been renovated to a high standard, new roofs, part double glazing and gas central heating. The village of Oradour Fanais is only 2 kms from the house with a shop, petrol station and primary school.The property is great if you like country walks, close to riding, fishing and the Val de Vienne circuit. Close to the historical town of Confolens, l-isle Jourdain and Availles Limouzine for all supermarkets, hospital and amenities. Under 1 hour from all airports - Limoges and Poiters. Property descriptions and related information displayed on this page, with the exclusion of Running Costs data, are marketing materials provided by Selection Habitat, and do not constitute property particulars. Please contact Selection Habitat for full details and further information. The Running Costs data displayed on this page are provided by PrimeLocation to give an indication of potential running costs based on various data sources. PrimeLocation does not warrant or accept any responsibility for the accuracy or completeness of the property descriptions, related information or Running Costs data provided here.